Will Rondout be the Valley of the Giants? ACCORD – Local artist Maria Reidelbach would like the Rondout Valley to be known as the region of roadside colossus. Reidelbach, who created the giant garden gnome at Kelder's Farm in Kerhonkson, told the Rochester Town Board on May 5 that she would like to build more giants in the area, creating a regional tourist identity as the "Valley of the Giants." "Roadside giants are a tradition dating back to the Statue of Liberty," she said. People came from miles around to see the statue's hand when it was on display, she explained, and large monoliths such as the Elephant Hotel which once stood on Coney Island have drawn visitors ever since. 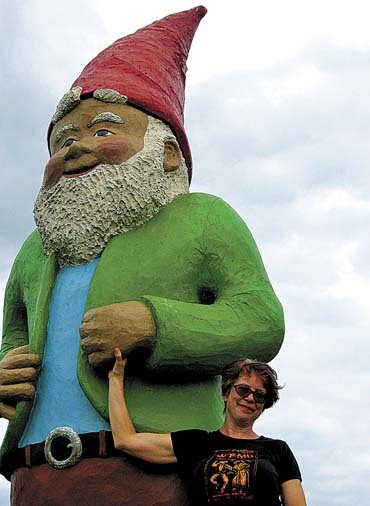 Since Reidelbach's gnome (whimsically named Chomsky) was erected on Route 209, people have regularly stopped to pose with the big fellow. Although it no longer holds the record as the world's largest garden gnome (two larger ones have been built since its debut in 2005), Chomsky still draws "giant thing collectors" and "gnome people" to the farm, she said. "It's put a face on Kelder's Farm," she said, giving the family business coverage all over the country "because we've got this really silly giant gnome." Statues like these draw people off the beaten path, the artist explained, and she would like to make more of them. She's presently working with a group who want to install a giant cement worker in Rosendale to honor that community's historic cement industry. She has other ideas, too, such as a "blueberry girl" for Ellenville and a forest peasant from traditional folklore for a Ukrainian resort. "Once we have some built, they will amplify each other, creating a regional identity of the Valley of the Giants," she told the board. The Rondout Valley already has a tremendous amount to offer visitors, and these giants would lure in the curious to discover its wonders. "People will want to see every giant." Beyond simply standing at the roadside, Reidelbach believes her giants can make money in their own right. She's planning to create a line of locally-made products which tie into the "Valley of the Giants" theme, citing examples of things like key fobs, activity books, and games. Some items would only be available for sale at specific locations, while others would be regionally sold. Richard Travers, president of the Rondout Valley Business Association, was very supportive of the idea. "The RVBA thinks it's a good idea to affirm the Rondout Valley as a destination," he said. "The valley has everything it needs," said Reidelbach. "This would just draw attention, and tell the story."